The city of Jaffna had been for years a major stronghold of the Liberation Tigers of Tamil Eelam (LTTE). The Tigers viewed the city as the capital of their new independent state. The city was briefly recaptured by the Indian army in 1987 during Operation Poomalai but the city was later captured again by the Tigers. The newly-elected president of Sri Lanka, Chandrika Kumaratunga, ordered this offensive after peace talks with the LTTE broke down after the Tigers attacked and destroyed Sri Lankan Navy gunboats and fired anti-aircraft missiles at Sri Lankan Airforce AVRO aircraft over Jaffna. Control of the peninsula became vital to the control of Palali airbase. Chandrika Bandaranaike Kumaratunga is a Sri Lankan politician who served as the fifth President of Sri Lanka, from 12 November 1994 to 19 November 2005. The country's only female president to date, she is the daughter of two former prime ministers and was the leader of the Sri Lanka Freedom Party (SLFP) until the end of 2005. In 2015 she was appointed as the chairperson of office for national unity and reconciliation. Jaffna Airport, also known as Palaly Airport and SLAF Palaly, is an air force base and domestic airport in the town of Palaly in Jaffna District, Northern Province, Sri Lanka. Located approximately 16 km (9.9 mi) north of the city of Jaffna, the airport was originally built by the Royal Air Force during World War II and later served as the country's second international airport before being taken over by the Sri Lanka Air Force. The Battle of Jaffna was a battle fought in two phases in August and October 2006 for the Jaffna peninsula. It was the fourth battle for the peninsula since the start of the Sri Lankan civil war. Eelam War IV is the name given to the fourth phase of armed conflict between the Sri Lankan military and the separatist Liberation Tigers of Tamil Eelam (LTTE), which is currently proscribed as a terrorist organisation by 32 countries. Renewed hostilities began on the 26 July 2006, when Sri Lanka Air Force fighter jets bombed several LTTE camps around Mavil Aru anicut. The government's casus belli was that the LTTE had cut off the water supply to surrounding paddy fields in the area. The fighting resumed after a four-year ceasefire between the Government of Sri Lanka (GoSL) and LTTE. Continued fighting led to several territorial gains for the Sri Lankan Army, including the capture of Sampur, Vakarai and other parts of the east. The war took on an added dimension when the LTTE Air Tigers bombed Katunayake airbase on March 26, 2007, the first rebel air attack without external assistance in history. 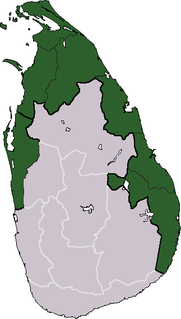 The Battle of Mullaitivu, also known as the First Battle of Mullaitivu and codenamed Operation Unceasing Waves, was a battle between the militant Liberation Tigers of Tamil Eelam and the Sri Lankan military during the Sri Lankan Civil War for control of the military base in Mullaitivu in north-eastern Sri Lanka. The Battle for the A-9 highway was fought in March and April 2000 for the control of the Sri Lankan A-9 highway. The First Battle of Elephant Pass was a battle fought in July 1991 for the control of the Sri Lankan military base of Elephant Pass, which was of strategic importance as it linked the northern mainland known as Wanni with the Jaffna Peninsula. The battle was fought between troops of the Sri Lankan army and the Liberation Tigers of Tamil Eelam, commonly known as LTTE. The Battle of Pooneryn was a battle fought on 11 November 1993 for the town of Pooneryn. LTTE codenamed this operation as Operation Frog. The Battle of Kilinochchi was a battle that occurred in September 1998 for the control of the city of Kilinochchi in Sri Lanka. The battle was fought between the Sri Lankan Army (SLA) and the Liberation Tigers of Tamil Eelam (LTTE). Operation Riviresa, was a combined military operation launched by the Sri Lankan Armed Forces in Jaffna. Starting on the 17 October 1995, the primary objective of the operation was the capture of the city of Jaffna and rest of the Jaffna peninsula from the LTTE. It is believed that Operation Riviresa was the largest and most successful military operation in Sri Lankan Armed Forces during the Third Eelam War. Operation Jayasikurui, was a Sri Lankan military action launched on 13 May 1997; it lasted until it was called off in 1999. The primary objective of this operation was to clear a land route to the government-held Jaffna peninsula through territory held by the LTTE, by linking the government-held towns of Vavuniya and Kilinochchi. At the time it was the largest military operation undertaken by the Sri Lankan military. Initially, the Sri Lankan military experienced success by forcing the LTTE out of Killinochchi, capturing vast areas, however the LTTE managed to launch a brutal counter-attack which reversed all gains made by the government. After failing to achieve their original objective, the Sri Lankan Army called off its operation. 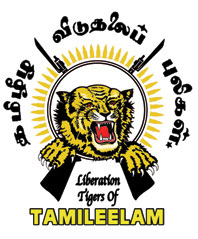 Velayuthapillai Baheerathakumar was a leading member of the Liberation Tigers of Tamil Eelam (LTTE), a separatist Tamil militant organisation in Sri Lanka. He played a leading role in the LTTE's military victories in the Vanni during Eelam War III, including Mullaitivu (1996), Kilinochchi (1998), Oddusuddan (1999) and Elephant Pass (2000). He was killed at the Battle of Ananthapuram in the last days of the Sri Lankan Civil War. The Battle of Kilinochchi was a land battle fought between the Sri Lankan Military and the Liberation Tigers of Tamil Eelam (LTTE) for the control of the town of Kilinochchi in the Northern Theater of Eelam War IV during the Sri Lankan civil war between November 2008 and January 2009. The town of Kilinochchi was the administrative center and de facto capital of the LTTE's proposed state of Tamil Eelam. 1 2 Sri Lanka - DangerFinder Archived November 5, 2007, at the Wayback Machine. ↑ "1995: Jaffna falls to Sri Lankan army". BBC News. December 5, 1995. ↑ "Sri Lankan army hails capture of Jaffna". CNN. December 5, 1995. Archived from the original on March 20, 2005. ↑ "Sri Lankan troops continue push into rebel territory". CNN News. April 21, 1996. Archived from the original on February 22, 2005.